1. What is CAT Exam pattern? 2. What is CAT syllabus? 6. What are the best b-schools in India? 7. What exams to take up other than CAT exam? Scroll down the page to know the answers to the above mentioned questions. What is CAT Exam Pattern ? Watch the video to get a quick overview. Or, if you are from the small minority that likes to read, click on this link to see Actual CAT 2017 paper, and PDF's that contain the actual question paper in a student friendly format with embedded Video solution links. What is CAT Syllabus ? CAT exam officially does not prescribe a syllabus. But based on what we have seen in CAT exam over the past many years, we can reasonably infer some things. Watch the video to know the outline, or of course you can click on this link to get an overview of all topics discussed as a part of 2IIM's online CAT coaching and how to schedule your preparation as a bonus to getting to know the syllabus. To be eligible for CAT exam, there are a bunch of requirements. Eligibility criteria for admission through CAT may be different and specific to the institute. 2. The CAT exam aspirant must have completed education upto Graduation. 3. Candidates in their final year of Graduation are also eligible to apply. 1. Stage 1: Shortlisting of candidates on the basis of CAT exam score, Past Academic Scores, Work Experience. 3. Final shortlist or calls based on performance in Stage 1 and Stage 2. CAT exam has 70 - 75 Multiple Choice Questions (MCQs) with each correct answer fetching +3 marks and each incorrect answer fetching -1 marks. Rest of the questions (25 - 30) in CAT Exam are of Non-MCQ Type without negative marking. What are the Best B-schools in India? There are so many of these entrance exams that it is all very overwhelming. So, let us see if we can get some clarity out of these. Almost all universities in the US, UK, Australia, Singapore, Europe select based on GMAT. In India ISB and Great Lakes select based on GMAT. All the IIMs (+ MDI, XLRI etc) use the GMAT score for admissions into their executive MBA programs. CAT or GMAT, which one should I take? 1. If you want to do in India, take CAT. If you want to go abroad, take GMAT. If you have 2-4 years of experience, and not sure whether you want to do MBA in India or abroad, then the decision is even simpler. Take both. The big two are CAT and GMAT really, XAT is important because it can give you a second option. What about these other exams? Now, IIFT selects based on a separate exam. Symbiosis uses SNAP, NMIMS has NMAT. These three give you access to narrow groups of colleges, so write these based on whether you like that particular college. There is a government-mandated CMAT and then MAT. Of these, CMAT is more or less useless. MAT is accepted in a lot of private colleges, but there is practically no college that accepts MAT that will not give you a seat based on a good CAT score. If you are confident of getting 90th percentile in CAT, then skip MAT. What about the quality of the CAT exam? CAT is of a good quality (note high quality, not difficulty). The quality of the GMAT exam is even better. Now, what do I mean by quality? The questions are challenging but not impossible, the level of difficulty is consistent, the framework is well defined and the exam is generally well conducted. Among the others, IIFT and NMAT are alright, at least they care enough to set decent papers. The really worst papers are XAT and SNAP. XAT papers usually carry errors and have wild variances in difficulty across sections. SNAP also do not care much about the way they set their papers. Symbiosis probably thinks it is a good idea to sell some applications and create some excitement around the college name. SNAP has been accused of even picking some questions from freely available sources on the web. The following chart should give an idea about all these exams, their level of difficulty, their quality (subjective opinion, bear this in mind) and how many people take these exams. So, how does one prepare for all of these? Prepare for CAT, forget all other Indian exams. If you are taking any of the other Indian exams, all you will need to do is make are a few some adjustments that shouldn’t take more than 3-4 days. Focus slightly more on XAT; because even though the paper is inconsistent XAT can open more doors than most of the other exams. Plan for GMAT separately. Since it is an American exam, you will need to make some adjustments regarding what is more vital. GMAT tests concepts better, and de-emphasizes computation. GMAT verbal is also tougher than that of CAT. So, even though more than 75% of the syllabus is common across CAT and GMAT, a few adjustments need to be made. How CAT, XAT and GMAT are different, syllabus-wise? Explaining the abbreviations used in the diagram FIJ – Fact, Inference Judgement. Even CAT Seems to be phasing this out. You should see a maximum of 1-2 questions from this in the exam. P&C – Permutation and Combination. Note: that this is a broadly indicative chart. Kindly do more research on your own after keeping this as a starting point. Dont get all officious about it if I have missed some topic or category. Those of you feeling a little lost amidst all this talk of percentiles, slots, analysis, syllabus etc, scroll up to know about every aspect of What is Exam ? Those of you just beginning on this CAT preparation journey, Click here to know about every aspect of How to Prepare for CAT? . To learn everything about CAT Exam syllabus, click here to know CAT Syllabus . How has the CAT Syllabus changed over the past 10 years? People pick and choose ways to find loopholes in the system at multiple places. Systems are created to be overlooked is the usual premise with which Indians work. This was also applicable to CAT Exam as well, to a great extent. CAT has removed the gaming ability in the exam to maximum extent possible. How did they do this section wise, slowly, year after year, is detailed below. Who conducts the CAT exam? CAT is conducted by a different IIM each year. CAT 2016 was conducted by IIM Bangalore, CAT 2017 was conducted by IIM Lucknow and CAT 2018 was conducted by IIM Calcutta. What are some motivational stories of Common Admission Test (CAT)? Every day, we are conditioned to hearing of great stories of back-to-the-walls, against-the-odds efforts from people that take them to great heights. CAT preparation journeys are likely to be far more mundane and regular than that. CAT is a patently non genius exam. So, get tuned to the idea of preparing for it diligently, regularly and relentlessly, albeit with a lot of fun. What are the few things that a CAT aspirant must keep in mind in the first few months of preparation? Read. A lot. Learn from first principles. If you know the test of divisibility by 9, know why it works. Spend less than 30 minutes each day on social platforms - this includes FB, Quora, Youtube, Twitter, Instagram, and whatever other nonsense comes up and takes your precious time. Stay away from free advice and people who babble on about preparing. What are some common myths about CAT results? How important is having a good vocabulary for CAT? Is it possible to cover the entire CAT syllabus within 6 months? Most definitely yes. Because, remember that CAT exam tests basic intelligence of class VIII, IX and X level in a standardized format. Allocating 15–18 hours per week will suffice. But the thing is those 15–18 hours should be high quality hours, Distraction-free hours with intense concentration and focus to the exam. Always remember that the Quality matters more than Quantity. Throw that in and you will be surprised at how easy this course is and you will be comfortably over the line. P.S: Get out of Quora, Facebook etc. for 6 months and most of them can find their hours for preparation. I got 98.54 percentile in cat this year but wasn't able to secure call from IIM A,B or C. Should I try again next year or should I settle for newer IIM's? This Question has no direct simple answer. There are set of points to be seen to reach at the final decision. •	98.54 is not good enough or even 99.54 is not good enough either. So, if you want to be in any of ABC next year, you need to go from 98.54 to 99.7+. Evaluate with all those factors in mind. •	If all of your XAT, SNAP, IIFT, NMAT went well in the same year, then you can think of the getting 98th percentile as a guarantee next year too and so give this a go. •	If you are a fresher, then take your chances next year. But if you already 3 years of experience then plan to take the best option available. •	Think of the salary package you have. If you are employed at Rs.2.5 lpa then choosing this offer will be a pragmatic decision. But whereas, if you are employed at Rs.10+ lpa then new IIMs will not be the best option. P.S: This question is about risk appetite and is deeply personal as it will differ from person to person. So, think about your factors and take the decision. But anyways, 98.54 is a damn neat percentile. Congratulations on it. Do IIMs take into account the institute while considering the graduation score? In the initial stages, there are no such bias. But usually, the quality of work experience, the value of the degree from college and all other intangible factors get factored in in the second round of selection. To make it simple, a score of 82% in Correspondence Course in BA Geography done from Annamalai University will be treated as better academic qualification that a CG of 7.8 in IIT Madras Computer Science even though apples and oranges cannot be compared. This is the reality. What is the difference (preparation and other factors) between a 97, a 98, and a 99+ Percentiler in CAT? Are they equally good, but had different performances on the D-day? •	The Climb from 97th percentile to 99.5th percentile is a substantial leap. One would probably have to increase the score by around 30% to make this climb. Any score gives you some kind of signal of underlying performance. Anyone can underperform or outperform in a 3-hour test. A score usually gives a signal like this graph below. 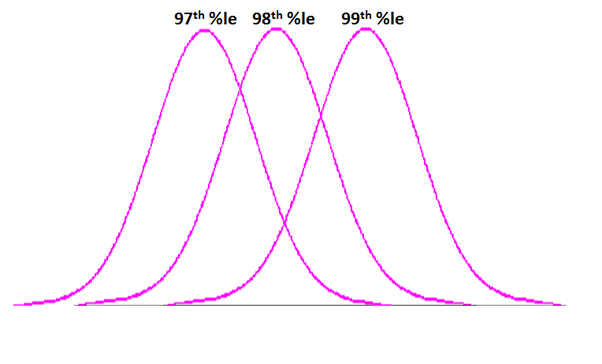 •	The 97th, 98th and 99th +Percentiles, the curves probably look like this picture below. •	There are candidates who have scored 97th percentile and better than a few of those who scored 99th percentile in the exam. The ones at the right end of the 97th curve in the picture above are better than the ones at the left end of the 99th percentile curve. Primarily because of this variance, many colleges use other metrics beyond merely CAT performance to select the best candidates. They definitely want to acknowledge that percentile numbers probably carry some noise. •	Do they equally good give or take some luck? They may be or they may not be. •	As far as The CAT Exam is concerned, it is a reasonably high quality exam and is a reasonable predictor of underlying potential. What are some less known facts about CAT scores?